We see here that the week after opex for September, June, and March have in fact been the worst 3 weeks of the year over the last 31 years. You’ll also note that the whole group shown follow either the 1st or 3rd Friday of the month. And if I were to show the best weeks of the year, you’d notice that they all follow the 2nd and 4th Fridays of the month. 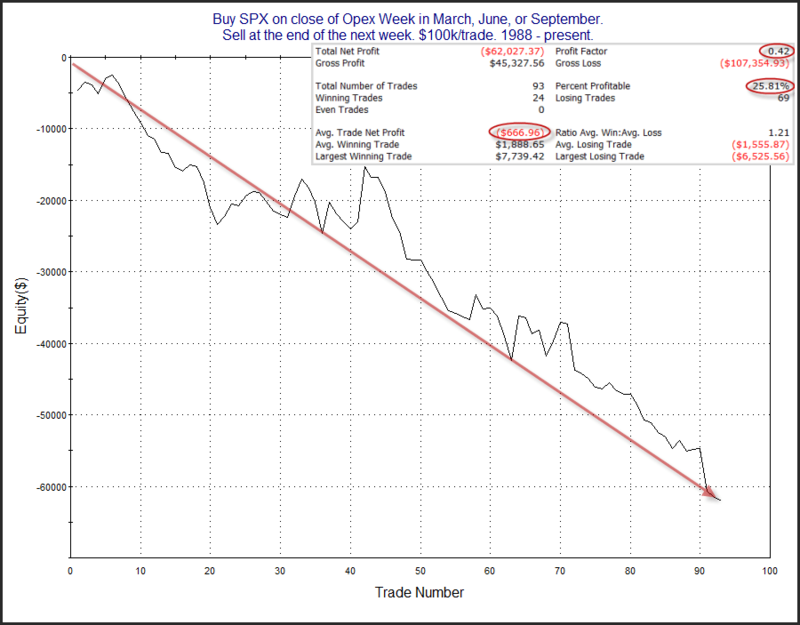 Below is a look at results if someone were to have bought opex Friday’s close in March, June, and September since 1988. The stats are poor as we knew they would be. The strong, steady downslope is also supportive of the idea of a seasonally bearish edge. Traders may want to keep this in mind next week.